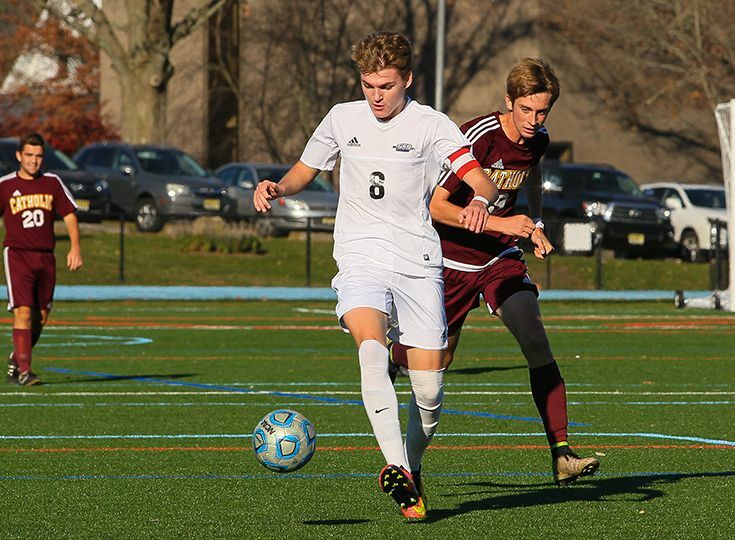 Steve Bednarsky ’17 was listed by NJ.com a Top-50 New Jersey alumnus in Division I Men’s Soccer. Bednarsky came in ranked 21st overall after starting all ten of Lehigh’s games so far this season. The Mountain Hawks are currently 3-0 in the Patriot Conference and recently came off a 1-0 win over 20th- ranked Cornell. Regarded as a “shutdown defender,” Bednarsky also started 15 games during his freshmen season and was a third team All-Patriot selection. The former Somerset County Player of the Year had a tremendous career at Gill and helped lead the Knights to two Non-Public B State championships and two Prep B titles. “First and foremost, as a dad I am very proud of Steve and his accomplishments,” said boys’ soccer head coach Tony Bednarsky. “As the Gill coach, it is great to have a player be recognized in the Top-25 among New Jersey alums. However, other former players like Anes Mrkulic ‘17 (Monmouth University) and Max Aunger ‘17 (Boston University) could definitely have made this list because they are very talented players as well”.